A protester shields his mouth and nose from gas fired by police during a demonstration after the inauguration of President Donald Trump. 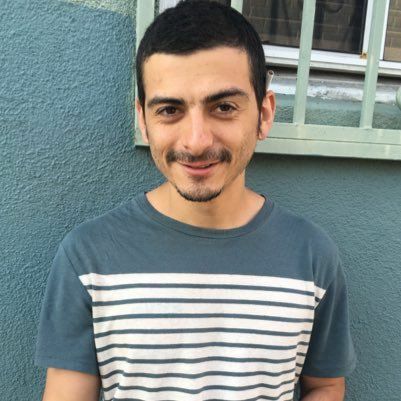 McAllen native and journalist Aaron Cantú was indicted May 30 on two counts of felony rioting, conspiracy and five counts of destruction of property. He faces up to 75 years after a Jan. 20 mass arrest on Inauguration Day in Washington D.C.
As thousands gathered on Washington D.C.’s National Mall awaiting the historic inauguration of President Donald Trump in January, hundreds of others convened blocks away. 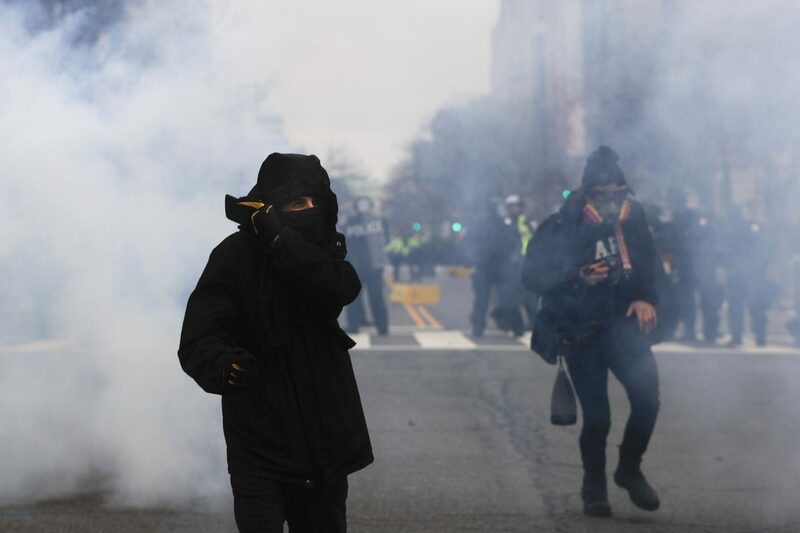 Donned in dark clothing, the crowd moved 16 blocks — from Logan Circle to 12th and L Streets — over half an hour “as part of a Black Bloc as individual co-conspirators committed acts of violence and destruction,” according to court documents. Attendees were then “kettled,” a police tactic where a crowd is corralled and contained in a designated space, including demonstrators, journalists and legal observers. Journalist and McAllen native Aaron Cantú pleaded not guilty Friday to two counts of felony rioting, conspiracy and five counts of destruction of property. He is facing over 70 years in prison. Other journalists’ charges were dismissed, with the exception of Cantú and photographer Alexei Wood, who live-streamed the protest. Cantú is also not included in other misdemeanor and felony charges for acts against police officers in an April 27 superseding indictment. He was indicted over a month later on May 30. Cantú and his lawyer declined to comment. The freelance journalist was senior editor of the online outlet The New Inquiry at the time, and pitched the story to Vice. The director of PEN America’s Free Expression Policy and Research, Katy Glenn Bass, called the indictment “overcharging.” She said the potentially decades-long sentence is a tactic to scare defendants into a plea. This would likely include forfeiting the right to sue later. Engel’s charges were dropped less than a week later. He said some reporters benefit from the statue of their publications. “Journalists who had the backing of an established publisher were in a much better position than freelancers to prove their journalist status, and that’s often the case in these kinds of situations,” said Engel in an email responding to an inquiry about Cantú’s freelance status with a small, online publication. “It’s interesting to note that police didn’t arrest every journalist present in the kettle — and in fact, they released some staff and some freelance journalists. The government’s case against most of the over 200 defendants relies on linking the illegal actions of some demonstrators to the whole and it seems the mass was arrested for the acts of a few, said Gregg Leslie, director of the Reporters Committee for Freedom Press Legal Defense. Superior Court Judge Lynn Leibovitz ruled that the government has to release cellphone data back to the owner of each mobile device by Aug. 25. According to the government complaint, the rioters were conspiring and communicating by text, chat, phone and email. However, there have been numerous objections to the government’s actions that are expected to continue to be part of the case. Defendants will stand trial in groups of eight, with Cantú’s trial scheduled for October 2018. Individuals are named in court documents when applicable. Otherwise, language attributing specific acts of destruction — breaking windows of businesses, throwing items into the street, spray painting, etc. — are vague and general. Charging a journalist for being in the proximity of crimes committed during a protest is troubling, said Bass, because that’s they’re job. In a January 2017 editorial, the Dallas Morning News called for the production of evidence or dismissal of Cantú’s charges. They also shared a video in which Cantú volunteers advanced knowledge of a Washington, D.C. demonstration, and a potential degree of coordination to an unspecified event. “Cantu was recorded on camera explaining how he’d played a small role in organizing the Jan. 20 protests,” wrote the Morning News editorial board. “Still, his online resume contains links to dozens of articles for many well-known, if also mostly very liberal, publications. While that conclusion is speculative, Leslie said even that couldn’t be enough to pin the rioting felonies on Cantú. “The charge for inciting a riot is that you’re right there encouraging people to fight and take illegal action. It should not mean that you helped organized a protest, even the night before,” Leslie said. “It’s not close enough connection to the illegal acts to suggest that you incited those acts … (and) planning a peaceful protest should not mean that you’re therefore liable if it turns into an act of vandalism or if some of the members of that protest somehow engage in more malicious activity. University of Texas journalism professor and Third Coast Activist Resource Center board member, Robert Jensen, agreed that journalists aren’t necessarily forfeiting their press rights by embedding themselves into situations. “Some media organizations forbid journalists from participating in political organizing and actions. I think that is generally a sound policy; journalists claim to authority is based in independent reporting, and being part of political movements calls that independence into question,” Jensen wrote in an email to The Monitor. “But if journalists choose to identify with a political movement and are transparent about it, they can, and often do, make important contributions. Cantú has reported on a range of issues including farmworkers’ rights, unpaid prison labor, private prisons, gentrification, national security, climate change, mass incarceration and other demonstrations. The 28-year-old was hired by the Santa Fe Reporter as a staff reporter a few months ago to cover criminal justice, education, healthcare and immigration. He’s written for VICE, The Intercept, Salon, the Guardian, Al Jazeera America and other publications. Cantú completed McAllen ISD’s International Baccalaureate program and graduated from Tufts University in 2011 with a bachelor’s in international relations and a minor in media and communications. Another reporter’s account of covering the inaugural protests. Read the Dallas Morning News editorial on the issue.